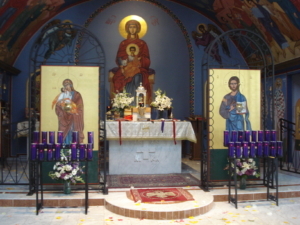 The Divine Liturgy is the primary worship service of the Church. The Divine Liturgy is a eucharistic service. It contains two parts: the Liturgy of the Catechumens, sometimes called the Liturgy of the Word, at which the Scriptures are proclaimed and expounded; and the Liturgy of the Faithful, sometimes called the Liturgy of the Eucharist, in which the gifts of bread and wine are offered and consecrated; the faithful then partake of them in the Sacrament of Holy Communion. The Church teaches that the gifts truly become the body and blood of Jesus Christ, but it has never dogmatized a particular formula for describing this transformation. The Prothesis (or Proskomedia), the service of preparing the holy gifts, can be considered a third part which precedes the Liturgy proper. 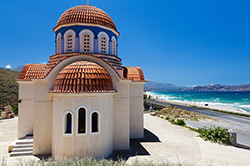 The Great Fast or Lent is the period of preparation leading up to Holy Week and Pascha. The Lenten Triodion governs the divine services of Great Lent as well as those of the Weeks of Preparation preceding Great Lent. Lent is a Middle English word meaning “spring.” The Great Fast has come to be called Lent by association; it is called “great” to distinguish it from the other fasts. Observance of Great Lent is characterized by abstention from many foods, intensified private and public prayer, personal improvement, and almsgiving. The foods traditionally abstained from are meat and dairy products, fish, wine and oil. (According to some traditions, only olive oil is abstained from; in others, all vegetable oils.) Since strict fasting is canonically forbidden on the Sabbath and the Lord’s Day, wine and oil are permitted on Saturdays and Sundays. If the Feast of the Annunciation falls during Great Lent, then fish, wine and oil are permitted on that day. Besides the additional liturgical celebrations described below, Orthodox Christians are expected to pay closer attention to their private prayers and to say more of them more often. The Fathers have referred to fasting without prayer as “the fast of the demons” since the demons do not eat according to their incorporeal nature, but neither do they pray. Pascha normally falls either one or five weeks later than the feast as observed by Christians who follow the Gregorian calendar. However, occasionally the two observances coincide, and on occasion they can be four weeks apart. The reason for the difference is that, though the two calendars use the same underlying formula to determine the festival, they compute from different starting points. The older Julian calendar’s solar calendar is 13 days behind the Gregorian’s and its lunar calendar is four to five days behind the Gregorian’s. The Pascha date this year: April 12, 2015, next year: May 1, 2016, and April 16, 2017, the year after that. The cycle starts with a fast of forty days that precedes the feast. It is called the Nativity fast or Advent. For the faithful, it is a time to purify both soul and body to enter properly into and partake of the great spiritual reality of Christ’s Coming, much like the preparation for the fast of the Lord’s Resurrection. This period includes other special preparatory days announcing the approaching Nativity: St Andrew’s Day, November 30; St Nicholas Day, December 6; the Sunday of the Forefathers; and the Sunday of the Fathers. December 20th begins the Forefeast of the Nativity. 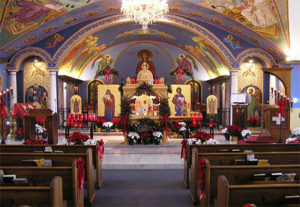 The liturgical structure is similar to the Holy Week preceding Pascha. The Orthodox Church sees the birth of the Son of God as the beginning of the saving ministry which will lead Him, for the sake of man’s salvation, to the ultimate sacrifice of the Cross. On the eve of the Nativity, the Royal Hours are read and the Divine Liturgy of St. Basil the Great is served with Vespers. At these services the Old Testament prophecies of Christ’s birth are chanted. There is also a tradition of Vale or Holy Supper. This is a 12 course lenten dinner served before the family goes to vespers. The Vigil of Christmas begins with Great Compline because Vespers has already been served. At Compline there is the singing of the Troparion and Kontakion of the feast with special hymns glorifying the Saviour’s birth. There are also the special long litanies of intercession and the solemn blessing of the five loaves of bread together with the wheat, wine, and oil. The faithful partake of the bread soaked in the wine and are also anointed with the oil. This part of the festal vigil, which is done on all great feasts, is called in Slavonic the litya and in Greek artoklasia, or the breaking of the bread. The order of Matins is that of a great feast. Here, for the first time, the full Canon “Christ is born,” is sung while the faithful venerate the Nativity icon. The Nativity according to the flesh of our Lord, God and Saviour Jesus Christ, also called Christmas, is one of the Great Feasts of the Orthodox Church, celebrated on December 25. In the fullness of time,[note 1] our Lord Jesus Christ was born to the Holy Theotokos and Virgin Mary, thus entering into the world as a man and revealing Himself to mankind. Though three magi from the East are commonly depicted as visiting during the event itself (or, in Roman Catholic tradition, twelve days thereafter), the Bible records the coming of an unspecified number of wise men as being a few years after Jesus’ birth (see Matthew 2). In either case, these magi came bearing gifts of gold, frankincense, and myrrh (Matt 2:11). In the hymnography for the feast, these gifts are interpreted to signify Christ’s royalty, divinity, and suffering. Though Jesus’ birth is celebrated on December 25, most scholars agree that it is unlikely he was actually born on this date. The choice of December 25 for the Church’s celebration of the Nativity is most likely to have been in order to squelch attendance at pagan solstice festivals falling on the same day. At least, this is the urban myth promligated by both heterodox Christians and unbelivers for centuries. However, the solstice festival fell on the 21st of December. To suggest that The Church chose a day of sacred observance defensivly instead of pro-actively is to devalue and disregard the sacred and authoritative action of The Church in establishing a proper date for the observance of The Nativity of Christ The Lord. Others within The Orthodox Church have observed that, under Hebrew law, male infant’s were both circumcised and received their name eight days after their birth. Also, within The Orthodox Church, January 1st is celebrated as the “name day” of The Lord Christ Jesus. Thus, the selection of December 25th to celebrate the nativity of The Christ (who would not be named for eight more days) would appear to have been a conscious counting backward from the first day of the calendar year–the day of his being proclaimed Son of Man–to the date of His birth, the day of his being proclaimed Son of God. Concluding the celebration of the Nativity of Christ is the Liturgy. It begins with psalms of glorification and praise instead of the three normal Antiphons. The troparion and kontakion mark the entrance with the Book of the Gospels. The baptismal line from Galatians 3:27 once again replaces the Thrice-Holy. The Epistle reading is from Galatians 4:4-7, the Gospel reading is the familiar Christmas story from Matthew (2:1-12), and then the liturgy continues in the normal fashion. The second day of the feast starts a two-day celebration of the Synaxis of the Theotokos. Combining the hymns of the Nativity with those celebrating the Mother of God, the Church points to Mary as the one through whom the Incarnation was made possible. St Stephen, the First Martyr, is also remembered on these two days. On the Sunday after Christmas the Church commemorates James the Brother of Our Lord, David the King, and Joseph the Betrothed. Eight days after the Nativity, is the feast of Circumcision of our Lord.